One of the debates I've had, with Christians and atheists, is whether Christianity is a materialist faith. It seems some American Christians are rather touchy about this. Communism is materialist and they're very scared of communism. Such debates can be difficult! One American Christian explained the Old Testament is dualist (matter / spirit) and not monist (matter), as he thought I was claiming. It seems I had said matter has a spiritual dimension and he was quite certain I had it the wrong way round, spirit has a material dimension. We also disagreed about dialectical materialism. Where, he asked, is the thesis, antithesis, synthesis in Christianity? Whichever way you look at it, matter has a spiritual dimension or spirit has a material dimension, you have a dualism. The two are set at contradiction with each other. The Christian writer was correct in saying spirit gives rise to matter, at least insofar as it is easier to see how spirit or consciousness, the perceiver, gives rise to the perceived. However, this contradiction between spirit and matter is not resolved by saying one gives rise to the other. Whichever way round, it implies one is superior to the other. The Christian faith has been plagued by this false dichotomy that seems to reduce to: spirit good, matter bad. But what we easily forget is Christianity is neither monist not dualist. 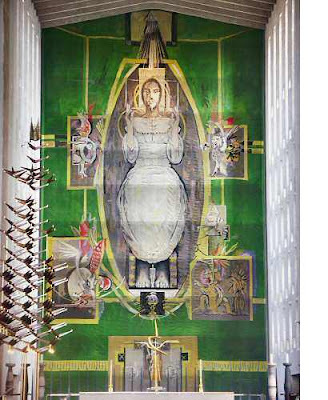 It is Trinitarian and this is why I reject the view that Christianity is not materialist. 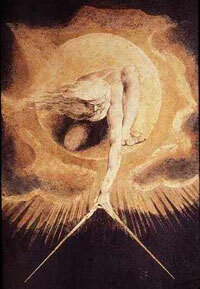 The synthesis that transcends the opposition between spirit and matter is implied in the Trinity, where God does not remain spirit but becomes flesh. Spirit and matter are placed into a new relationship and this is something taking place in our imaginations. That's the problem for many moderns, we're not prepared to make the effort to imagine how spirit and matter might be married. One of the most condescending things atheists say about Christians, is Jesus is our imaginary friend. Our faith is in our imagination, it has no reality in the material world. Well, yes of course it is. Where else can we encounter God other than in our imagination? We create works of art, find our way around our neighbourhood, study the structure of chemical molecules in our imagination. Why should we not encounter God there too? I'm not saying God has no reality outside the imagination, just that our imagination is where we encounter God. Are atheists really saying the imagination is in some sense not valid? If so, they have a problem. If imagination is not valid, what are the implications for science? Christians have a problem too. It is hard to claim God has an objective reality outside of the imagination because it is not possible to point to any evidence of God's actions outside of the impact imagining God has on human behaviour. And that in itself is a big problem. Human imagination is not terribly disciplined - how do we know what we imagine is real, is right, is ethical? Where the scientist has reality to check results of experiments, the Christian has few things to validate their position. Methodists identify scripture, tradition, reason and experience. Most traditions look to a similar list. But it is hardly surprising traditions cannot agree about everything. Also our imagination is prone to run away with us. We project our repressed negative thoughts onto others and onto God. We project what we know, kings and dictators, onto God and turn God into a monster. How can we possibly know whether we are imagining the right things? Sometimes debates between atheists and Christians can become rather tedious. The question of whether or not God exists seems to be endlessly fascinating to some. However, once you clock there's no possibility of proving either way, the argument seems rather pointless. One argument is science is materialist and doesn't allow for a spiritual dimension to life. This assertion, often accepted by both sides, has always seemed dubious to me. Science like all human activity is an act of imagination. In an earlier post I explained how all our experiences are subjective. Science helps us agree about what we perceive. Its bedrock is replicable experiments. We can take our local experiences and if they are replicable elsewhere we can add them to a resource of objective observations. It is that they are replicable that makes them objective. So, when we say science is materialist, what do we mean? Do we mean we have found a means to accumulate tried and tested observations, hypotheses, theories about the universe? A method that is extremely successful. Or do we mean that in some sense science reflects the universe as it really is? It is worth asking whether the success of science, as a materialist approach, reflects the universe as it is. Whilst the universe may be material, the means by which we wrestle with our observations and interpret them is through the imagination. This is the same means by which we write novels and compose symphonies. Think of Kerkule, who discovered the benzene ring after dreaming of the Ouroboros, the serpent holding its tail in its mouth. Or the many interpretations of quantum mechanics. The first is an example of a feat of imagination leading to a convergent solution on the specific structure of a specific molecule (although we can't see atoms and so any structure is in some sense imaginary). The second is an example of a divergent system, where speculations about its meaning are unlikely to lead to consensus. I'm not denying the effectiveness of scientific method. I am asking us to be careful when we assume a materialist approach reflects all we can know of the universe. I found an article by Slavoj Zizek in the New Statesman, dated 5 April 2010 (I'm somewhat behind in my reading). Incidentally this is the annual God issue; according to the editor, sales always increase for the God issue. Make of that what you will! Zizek's article is called Soul of the Party. 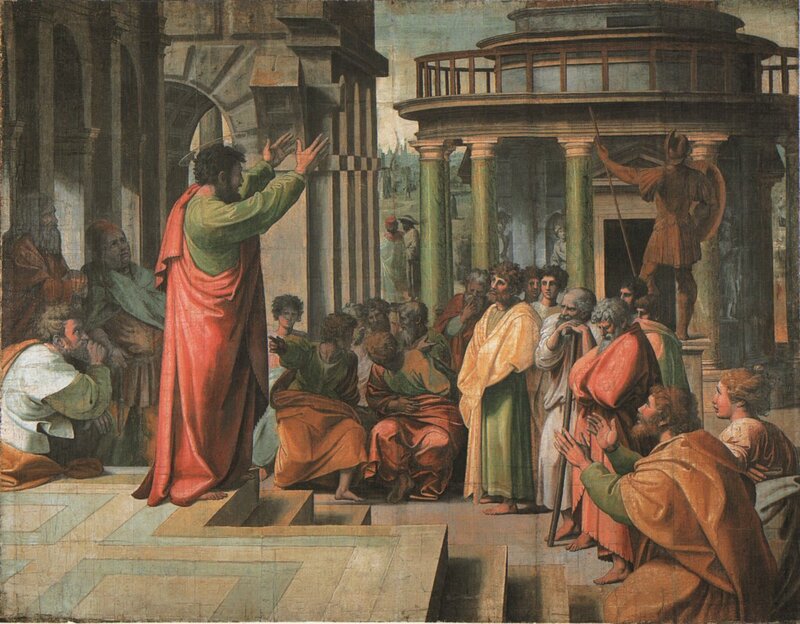 He aims to show how Paul (shown preaching in Athens from a cartoon by Raphael in the Sistine Chapel, and used to illustrate the article) used religion to rock the foundations of society. I have referred to some of the new takes on Radical Paul, particularly the works of John Dominic Crossan and Timothy Ashworth. Zizek is a communist and so in the eyes of some he cannot be a real Christian. I addressed this in a recent post. I intend to read his book The Fragile Absolute: Or, Why is the Christian Legacy Worth Fighting For? Here are a few quotes from the article. I hope Zizek won't mind me quoting him, he phrases things so well and it would be a pity to lose what he says. Fyodor Dostoevsky was aware of how God gives us freedom and responsibility - he is not a benevolent master steering us to safety, but one who reminds us that we are wholly unto ourselves. We are freed in Christ to become more truly ourselves. Too often the churches insist on moral rectitude, close to the law that Paul argues has been superseded. Our faith should free us to become perfect, it does not force us into a mould determined by the authorities (religious or secular). Of course, they are threatened by this and so the Christian is anything but steered to safety. I suppose the atheists will object to this; obviously it is a logical contradiction. To me it is a re-statement of the incarnation - we cannot know God, except through Jesus. There is a sense in which God does not exist because God cannot be known to us except through Jesus. What can a God who does not exist do but send his Son? For this reason Christianity is anti-wisdom: wisdom tells us that our efforts are in vain, that everything ends in chaos, while Christianity madly insists on the impossible. ... This is why Paul said, "I will destroy the wisdom of the wise" ... We should take the term "wisdom" literally here: it is wisdom (in the sense of "realistic" acceptance of the way things are) that Paul is challenging, not knowledge as such. I think this touches the root problem with atheism. It is close to the truth, as it rejects false images of God. But it ends up saying that what is given is all there is. For many people this is unacceptable - it is the argument of the Lord of the Manor and the wealthy in all times and cultures. We cannot change things? Oh, yes? When Christians buy into the way things are, in effect we are atheists. "For struggle is not against flesh and blood, but against leaders, against authorities, against the world rulers ... of this darkness, against the spiritual wickedness in the heavens" (Ephesians 6:12) Or translated into todays language: "Our struggle is not against concrete, corrupted individuals, but against those in power in general, against their authority, against the global order and the ideological mystification that sustains it". I'm sure this is right. It is our faith in human institutions, including the church, which undermines faith. This is why violence is not appropriate for Christians, violence identifies the wrong enemies. Dark matter and dark energy make up 96% of the universe. So, is God in the dark matter or dark energy? Well, whatever the truth, it is not true to say there is nowhere in the universe for God to be found. The problem is, of course, theologians will tell you God the creator is not in the universe; that would be to confuse the creator with the created. Perhaps we can search outside the universe? String theory has 10 dimensions. Plenty of room for God there, outside the universe as we perceive it. I'm simply showing it is not illogical to believe in God, there is no evidence for God in any of these places. For the atheist there is only matter, no spirit. For the theologian too often matter is inferior to spirit. This is the old gnostic heresy and is still prevalent amongst many Christians. Let's look at the theology. God loves matter. God is the creator and holds matter in existence - this is part of our foundational belief. Furthermore, the Christian believes God became incarnate in human flesh. This means, whilst the scientist might look for God in dark matter or other dimensions, the Christian seeks God in the stories of Jesus and his followers. God is not out there somewhere but close by, albeit hidden. Maybe God is out there somewhere but essentially the God out there is unknowable. If we want to know God, we must look to the life, death and resurrection of Jesus. This is the only way we can know anything of the nature of God. Why is God hidden? Because God is in the here and now. God inhabits the world of our senses but is found only by accident, by glimpses or revelations. No-one can produce proof or be categorical; God is revealed now and then, here and there. All stories are part of a greater story, all words part of a greater conversation.